← Will the negawatt solution work in the domestic sector? And this is indeed the best three-quarters of a book I have read on climate change (or more precisely, what we need to do to having anything like a good chance of avoiding cataclysmic climate change, something like dangerous climate change now already pretty much unavoidable). Berners-Lee and Clark themselves avoid getting bogged down in unnecessary detail and cut through to the core of the issues. Every time I thought they’d missed a key point, they themselves made it, usually very well, a paragraph or two later. I can’t think of any other publication which lays put the issues so clearly and succinctly. I’d certainly recommend buying it for this part of the book alone. As the authors themselves say, the book has two key messages. The first is that if we are to avoid catastrophic climate change, we can’t burn even half of the fossil fuels we know are in the ground. The tortuous link between modelled chances of avoiding certain levels of warming, concentrations of GHGs in the atmosphere and carbon budgets is very nicely and clearly followed back to data on fossil fuel reserves with some great graphics. The basic take-away fact is that to have even a 50:50 chance of avoiding 2°C warming we can burn no more than just over half of remaining proven reserves of fossil fuels, or a tiny proportion of estimated probable reserves. That is less than we have used since 1850, and of course the world economy is a lot bigger now than it was then. The underlying problem, then, is that we can’t tackle climate change on anything like a safe basis by waiting until we run out of fossil fuels and then doing something afterwards. We have to leave a lot of them in the ground. The big challenge here is that fossil fuels are still pretty cheap to extract. As Berners-Lee and Clark point out, while the average price of oil, gas and coal can go quite high, the marginal cost of extraction in low-cost countries remains very low, and it is beating this marginal cost that matters for any alternative low-carbon energy source. This relates to the second central message of the book – that a lot of things we think are helping (or will help) to reduce emissions do not actually work at the system-wide level. This includes energy efficiency (because of the rebound effect), intermediate fuels like gas (because they make higher-carbon coal cheaper elsewhere), or even low- or zero-carbon energy like renewables or nuclear (until they reach really low cost able to compete with the marginal cost of production of fossil fuels). They are very clear that they are not against these things, but argue that they will only be effective if they are combined with the one thing that will make burning all the fossil fuel we have unattractive – i.e. pricing carbon across all countries so that it becomes prohibitively expensive. So, if carbon pricing (either through tax or through emissions trading schemes) is the policy answer to the burning question, why has it been so difficult to get agreement to this at the global level? Berner-Lee and Clark answer this in four parts. First, the interests of fossil fuel companies. They include not only the West’s oil and gas giants, but also the state-owned companies of OPEC and others countries, and make the link between fossil fuel ownership and obstruction in the UNFCCC process. Second, the fact that pricing carbon and developing alternatives will have a cost and may slow economic growth. While they acknowledge the critical literature on growth, they reach the (sensible in my view) conclusion that jettisoning economic growth as an objective remains a major political barrier. Third are the myriad psychological factors that make us reluctant to face up to the reality of climate change and take action, despite the fact that, as Berners-Lee and Cark note, a majority of people believe in the man-made climate change and do express concern over it. Fourth are the familiar problems of collective action and burden-sharing in international negotiations. The fact that this is such a clear and compelling laying out of the nature of the problem makes the last quarter of the book, on what to do about it, so disappointing. There are a number of largely uncontroversial and pretty conventional policy recommendations, but what seems to me to be the weakest part is the account of how Berners-Lee and Clark expect the political change needed for the policies to come about. They rightly describe climate change as the biggest and most intractable environmental problem we face, one on which politicians are “terrified” of taking action because of short-term backlash, and of which psychologists have said that “you almost couldn’t design a problem that is a worse fit for our psychology”. Faced with this unprecedented historical challenge, their response is a sort of Woodstock-style “if we think really hard, maybe we can stop the rain” call for everyone to “wake up”, for climate campaigners to make their messages more direct, with the facts heard “loud and clear”, for “protests, petitions and consumer boycotts” of fossil fuel companies, and overcoming that old chestnut, a simple “lack of leadership”. The main thrust of the message here seems to be that lately environmentalists have avoided spelling out the awfulness of climate change and tried to weave positive but more instrumentalist framings around policies instead, and that this is a mistake. Berners- Lee and Clark argue that “reality needs facing head on – and anyhow the truth may be more interesting and inspiring than the watered down version.” In this, they seem to agree with the Common Cause-type approach, that sustainability will require a deep sea-change in values and beliefs rather than mere acquiescence with policies. The problem with all this is that it simply doesn’t fit with their rather good analysis in the book up to that point. As they note, GHGs are invisible and odourless, climate change is an abstract concept and its worst effects will be felt a long time from now, while we tend to be pretty short-termist in our outlook, and we tend to have optimism bias. This doesn’t mean that we don’t believe in or are worried about climate change – as they point out, the evidence is that most of us do, and are – but it does mean that it is not a highly salient issue for most people, while the short-term costs and hit on growth that ending fossil fuel dependency would involve are much more on peoples’ radar. In this kind of situation, why would a louder and more confrontational stating of what we know about climate change make a difference? There are two possibilities. One is that it is lack of information that is the problem. This is not totally compelling, since that information is out there, reported, albeit patchily, in the media and in books like Mark Lynas’s Six Degrees. In addition, Berners-Lee and Clark’s own analysis implies that the problem is less lack of information and more a reluctance to engage with that information (or simply a lack of interest). A second possibility is that a louder and clearer message will actually change people’s willingness to engage with the information that is already out there. In other words, would more vigorous action, especially by climate campaigners, get climate change higher up the list of political priorities again? Again, it is not at all clear why this should be the case. The analysis and evidence in the book suggests that people’s political priorities tend to be driven by clear and present dangers or opportunities, and despite events like Hurricane Sandy, the salience of climate change remains too low to force big changes. It is unlikely that a large enough majority of people will respond to warnings from climate campaigners that things are going to be really bad a few decades down the line by stopping worrying about recession and falling living standards and starting to worry more about climate change. In fact, Berners-Lee and Clark seem to be giving mixed messages about the strategy of sending a “loud and clear” message. On the one hand they are bemoaning the act that we are sleepwalking into disaster. On the other hand they wax lyrical about Bill McKibben’s recent strong piece in Rolling Stone and how this is awakening a generation of college students to climate change and 350.org. Suddenly what seemed impossible is happening before our eyes! But in reality Bill Mckibben has been sending out these messages for years, as has Jim Hansen (and Al Gore, and George Monbiot, and Kevin Anderson), but if they were effective in getting wider change, this book need not have been written. In earlier chapters the book actually transcends the usual environmentalist account of politics as almost exclusively about corporate interests, and acknowledges the degree to which mass public opinion and psychology is a problem. But it doesn’t seem to follow through when it comes to what to do next. In particular, there isn’t really a strategy for widening and building the coalition for mitigation policies. This absence is not just at the level of national politics, but also in relation to a global deal. The chapter on burden sharing and a global deal doesn’t engage with the two central issues – incentives for participation and enforcement mechanisms. Both of these are likely to involve trade measures, but discussion of these is absent. [UPDATE – it’s been drawn to my attention that there is a discussion of trade measures in Chapter 15 that I have to admit that I missed – many apologies to Berners-Lee and Clark for that. However, it remains that case that the two issues mentioned above are so central to the dynamics of the global process that no deal worth its salt can be made unless they are addressed – something that is not really engaged with in the book]. 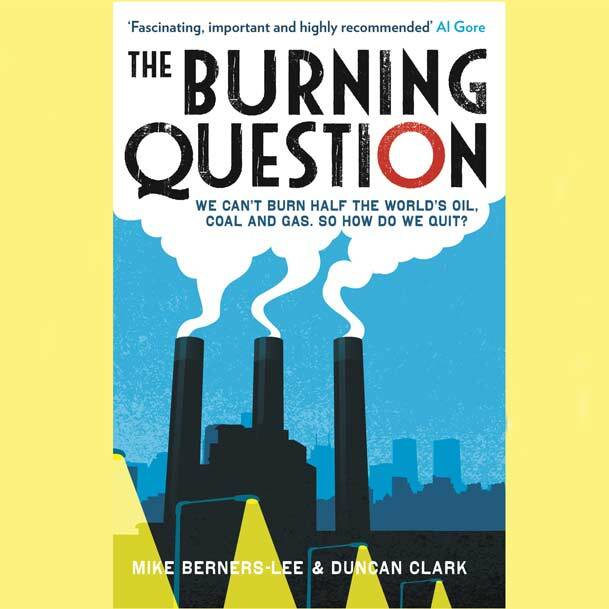 The Burning Question remains a great book, but it’s a real shame that the strength of environmental and economic analysis isn’t matched by stronger political analysis and a strategy that follows on from it. This book will, I think, provoke some debate within the environmentalist movement about how people talk about climate change to their constituencies and the public, which is not a bad thing. But will it succeed, as its authors obviously hope it might, in waking up that public? The danger is that it is only those who are already awake and listening who will hear. Thanks for this review, Matthew – I am half way through the book and share your enthusiasm. ‘Climate change psychology’ is so problematic that I suspect it will not be possible to construct any kind of mass movement through popular ‘mobilisation’ unless we have unignorable signals of climate disruption that cause major damage year on year in the West, in which case that could be a sign that it is too late for mitigation to ‘work’ in any observable timeframe. The blockages that we face are political and economic. The political stasis can only be changed by either pressure from electorates – unlikely for many reasons – or lobbying from a critical mass of businesses for strong regulation and technology policies. The latter could well happen and needs to be the focus for campaigners. Some CEOs of major corporations are breaking ranks, eg Paul Polman of Unilever, and openly questioning the viability of current capitalism and the lack of urgent approaches to climate risks. The food sector as a whole is becoming alarmed by climate disruption. A large coalition of TNCs and NGOs for strong climate policy might be enough to help politicians exercise ‘followership’, the best we can hope for, I fear. Thanks for this excellent review… I must read the book. You referenced Six Degrees – by Lynas – if we look at each degree, and merge it with the IPCC model chart, it is very clear what is happening. We are SO lucky that this challenge is driven by the laws of physical laws – like thermodynamics. Global warming is not a religious dispute, not a war over trade, not about race nor ideology. And this is not really about economics, it is purely, ruthlessly about discovering the science of what will unfold in our environment. It is purely a damage report on our planetary life support systems. . It is as if we stepped out of the airplane without a parachute – and as we learn about gravity, we are forced to knit one. And like great human caused catastrophes of the past – our momentum moves us to the danger, all we need to do is swerve. Like the Titanic and the iceberg – at some point we must slowdown and swerve. But now we are in the worst condition, where our inaction is the worst possible action. This is like a giant planetary intelligence test. All we have to do is learn and then react. Doing nothing is extinction. Thanks for this review Matthew! On the strength of it, I shall make it the one book on climate change issues that I (as a non-specialist) will read this year. But, if the first three-quarters of the book is all I need, where do I get something in depth on the ‘missing’ last quarter to complete the picture? A recommendation would be appreciated – and don’t be shy to recommend something you’ve written yourself…. Another useful book – which also doesn’t quite deliver at the end but is very much worth it for the first three-quarters – is Sociologist John Urry’s ‘Climate Change and Society’, published by Polity Press. He links the financial environmental crises effectively and points out that economics and the natural sciences have made all the running in the commentary on climate change, and that the other social sciences need to raise their voices.